Alexander Gomelsky is the father of modern basketball in the Soviet Union. 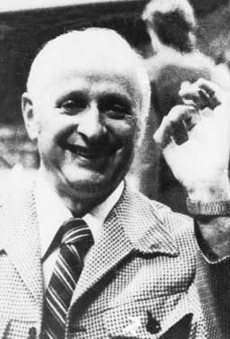 The success of Soviet (now Russian) basketball in the international arena is directly attributable to the coaching talents of this man. Gomelsky coached four Soviet Olympic teams––1964, 1968, 1980, 1988––winning a silver medal in Tokyo at his first Olympiad, the gold medal in his final assignment in Seoul, and a pair of bronze medals in 1968 and 1980. He was a Soviet assistant coach for the 1956 Olympic Games. Had the Soviets not boycotted the 1984 Olympics, he would have coached that year’s Olympic team. Gomelsky’s teams won World Championships in 1967 and 1982, was runner-up in 1978, and finished third in 1963 and 1970. They were also victorious at eight European Championships––1959, 1961, 1963, 1965, 1967, 1969, 1979, 1981; and winners of 15 Soviet Union national titles. The 5’5” Russian basketball mentor began coaching in 1945 at the age of 17, following two years as an All State player at Leningrad’s High School #79. He was an All-State star three years running at the Coaches College in Leningrad. Gomelsky coached SKA Leningrad 1948-52, ASK Riga 1953-66, CSKA Moscow 1966-88, and the Sbornaya (the Soviet National Team) 1958-60, 1962-70, and 1976-88. He also coached Spain’s Tenerife 1988-89, the European All-Star Team 1989-90, and Limoges CSP (France) 1990-91. He is probably best remembered in the West as coach of a Soviet Olympic basketball team that he did not coach. Gomelsky calls the 1972 Soviet team "my boys," but the KGB (Russia's secret police), fearing that the outspoken Jewish coach would defect to Israel, took away his visa, preventing him from traveling to the Mu­nich Games. Nevertheless, it was Gomelsky's Central Army Sports Club (CSKA) team, the 1972 Russian National Champions, that represented the Soviet Union in Munich, under a different coach. The gold medal match-up that year against the United States- that had never lost an Olympic basketball game- ended in the most publicly controversial result in the history of the quadrennial games. several ticks, and the Soviets were given the ball out of bounds. However, they had no success, and the game ended a second time. Then, once again, a floor referee made another judgment call, and again the Soviets were handed the ball with several new seconds on the clock. This extra life proved golden for the Russians. A length-of-the-court "Hail Mary" pass was converted into the winning basket. Gomelsky calls the moment the most exciting and most disappointing of his life. Although he has been relieved of his duties on five occasions when his international teams failed to win a gold medal, bringing home 'only' silvers and bronzes, Gomelsky has always been recalled and enjoys great popularity in and out of the former Soviet Union. Gomelsky has authored ten books on basketball that have been published in Russian and other international languages. He was elected to the Basketball Hall of Fame in May 1995.